There was no joy for Bosham and East Dean in their latest run-outs in the Southern Combination division two and West Sussex League Championship south. Here are the reports - and don't miss the Chichester Observer, out every Thursday, for all the latest local football reports, pictures, tables, fixtures and results. Bosham came away from a testing trip to Rottingdean with no points to show for their efforts despite an encouraging performance in a match that saw three penalties and a red card. The early going was even but conditions grew steadily worse as the half wore on with rain and wind setting in. Bosham were first to go close after 12 minutes when Steven Hurst let fly from long distance. His free-kick from 30 yards smacked against the bar with keeper Jordan White well beaten but the hosts cleared. A bizarre moment led to the breakthrough for the hosts as goal machine Zak Bolingbroke latched on to a lack back pass and slotted past the stranded Josh Harris. With Bosham on the back foot Rottingdean won a penalty that James Hobbs stuck away to double the hosts’ lead and leave Bosham at how it had all gone wrong. Bosham improved, with a lot more possession and territory, but a lack of quality in the final third hurt them. Right on half-time Harris conceded another penalty when put in an unenviable position by yet another wayward back pass. This time, however, the keeper made amends by saving the spot-kick brilliantly. 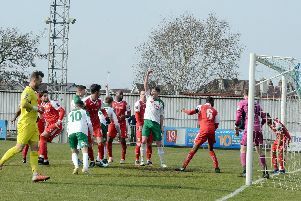 Moments later the Robins got the fortune that their play deserved when White needlessly upended Ryan Coombes in the box and Coombes slotted the penalty to halve the deficit. The second half saw Bosham dominate and create a host of chances to level. Raj King, Ben Bishop and Andy Reynolds all went close but White was in inspired form to keep them at bay. Reynolds was given his marching orders, leaving the Reds to battle with only ten men for the final quarter of the game, and Hobbs could have made them pay but his effort was volleyed wide. Rottingdean held on, leaving Bosham frustrated. This week Jarvis Brook visit Walton Lane. Bosham: Harris, Bulbeck, King, Bishop, Hurst, Buxton, Rustell, Jarrom, Coombes, Briance, Reynolds. Subs: Hancock, Terry, Desi, Redman. On a cold, windy and at times wet afternoon, East Dean lost at second-placed Predators as their their unbeaten start to the new year came to an end. Conditions made it difficult and two quick goals from the home side gave them a comfortable lead. East Dean tried to create chances down the right with attacking runs from Alex Smith and substitute Eli Dauya providing an outlet. Target man Andy Gould held the ball up well. Zach Dray had a opportunity from a free-kick but it was comfortable for the keeper. In the second half Pete Caveney came on for Dray and had a couple of chances but neither troubled the keeper. A Buster Strain ball fell for Dray, who had come back on, but his shot bobbled the wrong side of the post. East Dean: Philpott, Haynes, Freeman, Strain, Wordsworth, Smith, Dray, Cooper, Richards, Oram, Gould. Subs: Caveney, Dauya, Kearvell.